Microsoft hat für den Windows Home Server 2011 das Update Rollup 2 zur Verfgung gestellt. Das Update wird per Windows Update automatisch installiert. der Windows Home Server 2011 ist von Microsoft fertig gestellt worden (Release to Manufacturing)! Das wurde im Blog des WHS-Teams geschrieben Windows Home Server 2011 is Ready for Release. Today, the Home Server engineering team signed off the release version of WHS 2011. An exciting milestone which now starts the process to make it available for purchase. Affordable and easy-to-use, Windows Home Server 2011 is the ideal solution to help families keep their important digital files and data automatically backed up, organized, and accessible from virtually anywhere. To help with questions we hear during this time of the product release cycle, I have provided further guidance below. If you have a specific question, please feel free to post in comments, on our WHS forum. When will OEM’s offer WHS 2011? Many OEM’s and System Builders have already started building specific form factors and solutions based on WHS 2011. We expect to start seeing them in the market starting May. What languages is WHS 2011 available in? WHS 2011 will be released in 19 languages including Chinese (Simplified), Chinese (Traditional, Taiwan), Chinese (Hong Kong), Czech, Dutch, English, French, German, Hungarian, Italian, Japanese, Korean, Polish, Portuguese (Brazil), Portuguese (Portugal), Russian, Spanish, Swedish, and Turkish. When will the Evaluation for WHS 2011 be made available? The evaluation experience for WHS 2011 will be released in early April. When will I be able to download WHS 2011 via my TechNet or MSDN subscription? WHS 2011 will be made available on MSDN and TechNet also in early April. What is the difference between V1 of WHS and WHS 2011? You can learn more about differences in our comparison datasheet. During this time we would also like to thank all our MVP’s, partners and customers that have helped us get to this point. We look forward to sharing more information with you over the coming weeks. Ein Upgrade eines Windows Home Server 2003 auf die neue Version sieht Microsoft nicht vor. Es ist also eine komplette Neuinstallation des WHS nötig, sowie eine De- und Neuinstallation des WHS Connector auf den Clients. das Setup vom Windows Home Server 2011 ist im Grunde wie das vom Windows Server 2008 R2. das WHS Team heute die Verfügbar des Release Candidate von Microsoft Windows Home Server 2011 (WHSv2) angekündigt. Today we are pleased to announce the availability of the Release Candidate for Microsoft Windows Home Server 2011 (formerly Windows Home Server Code Name “Vail”). Affordable and easy-to-use, Microsoft Windows Home Server 2011 (WHS) is the ideal solution to help families keep their important digital files and PC’s automatically backed up, organized, and accessible. The Release Candidate (RC) signifies our last mile efforts for releasing this product to our customers, and prepares our network of software and hardware partners for its release. Along with the RC, we have also released an update to the Windows Server Solutions SDK which provides tools and information to develop add-ins and extend the functionality of Windows Home Server 2011. This WHS RC is the first public release to include changes in the storage features, so let’s look at some of the changes you can expect. All existing technologies such as server and client backup, health monitoring, remote web access, streaming media, and simplified dashboard management are still included. A new Move Folder Wizard makes it easy for you to move data from one drive to another. As Hard Drives are added to the Home Server, your health alerts will notify you that a new Hard Drive is available. From here, you can automatically format and configure the new drive for additional storage. Once configured, you can easily use the Move Folder Wizard to move your data to the new drive as needed. To see this in action, please watch our Windows Home Server Move Folder Wizard Learning Bite. Data protection also includes daily Server and PC backup, Previous Versions via Shadow copy which lets you return prior versions of existing files (without needing to restore from backup), and a protection feature for pre-defined folders (such as Recorded TV, Videos, Photos) in case these are accidently deleted. Thank you for helping us test this product, and please provide any feedback through WHS Connect, or our official Windows Home Server Support forums. Den RC gibt es bei Microsoft Connect zum Download. 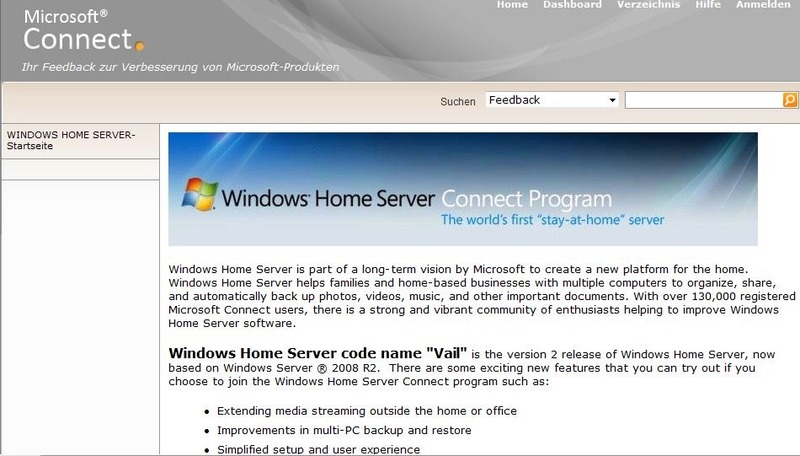 nach der Veröffentlichung der Preview Beta des Windows Home Server v2 „Vail“ ist seit gestern abend nun eine neue Beta Version („Preview Refresh“), mit der Versionsnummer 7657 auf Connect verfügbar. Diese soll unter anderem einige data-loss bugs beseitigen. Since releasing our first Vail beta we have received lots of great suggestions for „Vail“ and quite a few interesting bugs. Thanks to all of you who are beta testing! We love having you part of our extended team and appreciate your help.This new build has plenty of enhancements and improvements over the original build and can be downloaded from the downloads section of our connect site. If you are new to the beta, please go to http://connect.microsoft.com/windowshomeserver to sign up for the download. You can provide feedback about the new build through our Connect site and even log ideas or feature suggestions for future versions of Windows Home Server. Der Data-Loss Patch “QFE KB2314472″ soll nach der Installation von Vail auf dem Server installiert werdebn um Probleme beim Kopieren von Dateien in die Freigaben zu vermeiden, wenn Daten >1TB auf dem Server vorhanden sind. Microsoft wird am 24. August ein neues Update für den Windows Home Server veröffentlichen. Das Update soll einige Fehler beheben, die nach der Verfügbarkeit des Windows Home Server Power Pack 3 gefunden wurden und im Knowledge Base Article 979453 beschrieben sind. Das Update wird automatisch über Microsoft Update installiert. // You cannot restore a client computer without manually creating partitions or mapping the source and destination volume. The backup must be stored on only one disk. The destination computer must have only one hard disk. The hard disk in the destination computer must be equal to or larger in size than the backup. The hard disk drive in the destination computer must be an internal hard disk drive. For example, IDE, SATA or e-SATA. // 2048-bit certificates will soon replace 1024-bit certificates. This update enables Home Server users to use 2048-bit certificates before 2048-bit certificates become the industry standard. After you install this update, you are asked to renew Website certificates if you have already registered the live domain for the websites. After you finish the renewal process, the website certificates are upgraded to 2048-bit. // You cannot change the backup settings if a volume that has backup-excluded folders is not available. In this situation, you must wait until the volume becomes available. After you install this update, you can remove a missing volume that has backup-excluded folders from the backup process. // You cannot remove all users‘ permissions from a shared folder. When you try to remove the permissions, the Windows Home Server console reports that the operation succeeds. However, the permissions are not removed. After you install this update, you can successfully remove all users‘ permissions from a shared folder. If you tried to perform this operation before you install this update, the permissions will be removed when you restart the computer after you install this update. // You may experience incompatibility issues when you use the next version of Microsoft Security Essentials on Windows Home Server. This is a precautionary update. Windows Home Server is currently not supported by the next version of Microsoft Security Essentials Beta or final release. This update will address some incompatibility issues. You cannot restore a client computer without manually creating partitions or mapping the source and destination volume. 2048-bit certificates will soon replace 1024-bit certificates. This update enables Home Server users to use 2048-bit certificates before 2048-bit certificates become the industry standard. You cannot change the backup settings if a volume that has backup-excluded folders is not available. In this situation, you must wait until the volume becomes available. You cannot remove all users‘ permissions from a shared folder. When you try to remove the permissions, the Windows Home Server console reports that the operation succeeds. However, the permissions are not removed. You may experience incompatibility issues when you use the next version of Microsoft Security Essentials on Windows Home Server. This is a precautionary update. Windows Home Server is currently not supported by the next version of Microsoft Security Essentials Beta or final release. This update will address some incompatibility issues. Dieses Sicherheitsupdate behebt eine vertraulich gemeldete Sicherheitsanfälligkeit in Outlook Express, Windows Mail und Windows Live Mail. Die Sicherheitsanfälligkeit kann Remotecodeausführung ermöglichen, wenn ein Benutzer einen schädlichen E-Mail Server besucht. Ein Angreifer, der diese Sicherheitsanfälligkeit erfolgreich ausnutzt, kann die gleichen Benutzerrechte wie der lokale Endbenutzer erlangen. Für Endbenutzer, deren Konten mit weniger Benutzerrechten konfiguriert sind, kann dies geringere Auswirkungen haben als für Benutzer, die mit administrativen Benutzerrechten arbeiten. Dieses Sicherheitsupdate behebt eine vertraulich gemeldete Sicherheitsanfälligkeit in Microsoft Visual Basic für Applikationen. Die Sicherheitsanfälligkeit kann Remotecodeausführung ermöglichen, wenn eine Hostanwendung geöffnet wird und eine speziell gestaltete Datei an Visual Basic für Applikationen-Runtime übergibt. Wenn ein Benutzer mit administrativen Benutzerrechten angemeldet ist, kann ein Angreifer, der diese Sicherheitsanfälligkeit erfolgreich ausnutzt, vollständige Kontrolle über ein betroffenes System erlangen. Ein Angreifer kann dann Programme installieren, Daten anzeigen, ändern oder löschen oder neue Konten mit sämtlichen Benutzerrechten erstellen. Für Endbenutzer, deren Konten mit weniger Benutzerrechten konfiguriert sind, kann dies geringere Auswirkungen haben als für Benutzer, die mit administrativen Benutzerrechten arbeiten. Natürlich wurden auch die Junk-E-Mail-Filter von Outlook und Windows Mail und das Tool zum Entfernen bösartiger Software aktualisiert.